The IPO market, moribund for nearly two years, is finally warming up. From January to May of this year, 52 companies sold shares in the public market for the first time, compared with only eight in the same period last year. 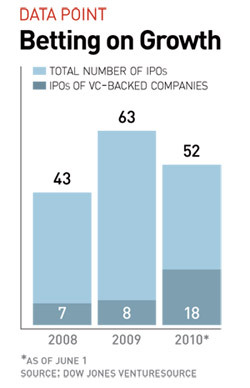 Another 106 companies intend to go public later this year. If you saw Avatar on the big screen, then you have used a RealD product. Co-founders Michael Lewis and Joshua Greer made a bet on 3-D after working together in Creative Artists Agency's digital media lab. The Beverly Hills company licenses proprietary 3-D technology for use in games, movies, and consumer electronics. Last year, its technology was used in films that accounted for 75 percent of the total domestic 3-D box-office receipts. But it also faces big-name competition from Dolby, IMAX, and others. Skeptics aren't certain RealD can repeat the huge boost the company enjoyed from Avatar, which helped push the company's revenue to $189 million for the fiscal year ending March 26, 2010, up from $45 million in 2009, a 324 percent growth rate. The Santa Clara, California, company designs and develops 4G chips for the next generation of mobile wireless devices. In 2009, the company shipped more than 2.5 million chips designed with WiMax, one of two technologies vying to become the standard for 4G. It is also developing chips using LTE, the other G4 technology. Revenue jumped 214 percent, from $14 million to $44 million, in 2009, but the market is competitive, and one customer, Motorola, makes up 51 percent of the company's sales. Big corporate clients such as Qualcomm and Kraft use analytics software from Qlik Technologies to visualize data such as sales trends and cash flow. Qlik, headquartered in Radnor, Pennsylvania, got an early edge in business intelligence software with in-memory technology, which processes data from a computer's memory rather than from disk storage. But as more software makers adopt in-memory technology, the company may have trouble maintaining its 33 percent growth rate. Sean Spector and Jung Suh couldn't find an online video game rental service. So, in 2002, they co-founded, with Toby Lenk, what is often called the Netflix of video games. The Los Angeles company is backed by Sequoia Capital, which also invested in Apple, Oracle, and YouTube. Gamefly, the largest video game rental service in the U.S., had revenue of $85 million in 2009. The company rents its 7,000 titles to more than 380,000 subscribers. But Blockbuster and Netflix have signaled interest in the market. Membership for Zipcar's swipe-and-go car-sharing service is more than 400,000 strong. Scott Griffith, a former Boeing executive, signed on as CEO in 2003, but the company has continued to lose money. Some of the IPO's proceeds will go toward paying down the company's debt. Still, Zipcar has the lead in the market for car sharing in North America, which could grow to $3 billion by 2016, according to one estimate.